A hip lifestyle hotel featuring 600 original pieces of artworks of the American contemporary artist Donald Sultan. The hotel is centrally located on the banks of the River Danube, opposite the world famous parliament and a 10-minute walk from both the Buda Castle and the downtown pedestrian shopping area. 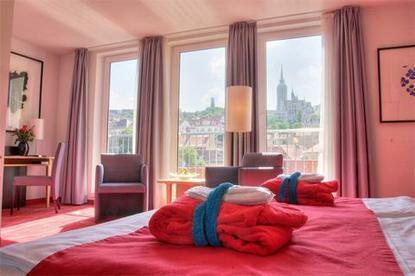 Guests' rooms are facing over the Parliament and Chain Bridge or Matthias Church and the Fishermen's Bastion. The hotel integrates four baroques townhouses restored to their original beauty. The trendy, design-led Chelsea restaurant serves fine, modern international and local cuisine. Domino Cafe & Bar with outdoor terrace is a trendy cafe serving delicious coffees, pastries and snacks. The 6 flexible conference rooms create a sophisticated setting for successful meetings and events. Other facilities include art gallery, sauna and fitness room, hair stylist, beauty parlour, valet parking and art shop.